The common retort to those who complain about the kneeling NFL players is that “they have a 1st Amendment right” and if you oppose them, you hate the Constitution. The problem with that line of thought is that the people opposing the players also have a 1st Amendment right. but how many of them can do what the players are doing and get away with it? Former Bremerton High School Football Coach Joe Kennedy has appealed his case to the 9th Circuit asking for an en banc hearing after a three Judge panel ruled that his prayers were an unconstitutional act of establishment. He argues that the ruling de facto says that school teachers have no 1st Amendment rights. Ken Burns newest documentary is well underway, and looks at the Vietnam War. There have been many reviews of it that are good and bad, some of them quite emphatic. Posted on September 25, 2017, in 1st Amendment, 2016 Presidential, American, Constitution, Donald Trump, Elections, Freedom of Religioin, Freedom of speech, History, Movie Reviews, Russia and Facebook, Vietnam War and tagged 1st Amendment, Constitution, Facebook, Freedom of Religion, Freedom of speech, NFL, Russia, Vietnam. Bookmark the permalink. 1 Comment. My opinion on the NFL – I believe in freedom speech, most of us do. But I also believe in decorum and a time and place for everything – a football field during your National Anthem is NOT the correct venue. These overpaid though highly athletic men become idols for children and adults alike, they should limit their political ideas to their private lives. 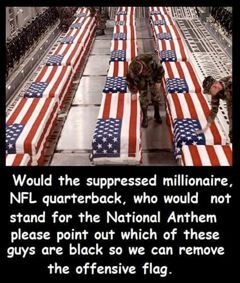 It is confusing how they defy the flag and the anthem, but will applaud a serviceman who fights for it. My son died a Marine and I personally take their actions as a slap on his memory and all those that fight under that flag to ensure their Freedom of Speech.